Traveling by air these days is far from the glitz and glamour of the airline heyday back in the 1950’s. There used to be something exciting about it. The airline personnel were dressed to the nines and would take care of you as if you were royalty. There was a bar area, spacious seating and a real feeling of luxury. These days that is decidedly not the case. Planes are cramped, and generally filled with grumpy people. The perks of flying have disappeared. You’re now charged for almost anything you could want during a flight, including the baggage you need to bring with you. And the security situation in the terminal is absolutely ridiculous. If you don’t think it through you could end up being bodily searched in a cramped, windowless room. So here are five tips to help you sail through airport security. First and foremost, make sure you pack appropriately. Most people try to bring their luggage on the plane if at all possible, to hopefully save the $50 charge for luggage. As an added bonus you won’t have to wait in those interminable luggage lines when all you want to do is get to your hotel and take a shower. But if you don’t coordinate your baggage based on your airline’s specs you might find all of those perks taken off the table. You won’t usually have a problem if there is plenty of space on the plane, but most flights are overbooked these days. The staff will remain adamant that your bag is the right size and shape. If it isn’t, you’ll have to check it through to your destination and wait in line with everyone else. You should also keep in mind that the liquid regulations are taken very seriously. You won’t even be able to bring a half bottle of water through the security line with you. The worst is if you forget there’s a bottle of something in the luggage you are trying to bring onto the plane. It will get flagged by security, and you’ll find your whole suitcase unloaded on the counter as everyone else passes you by. Get those six ounce bottles that are cleared by the TSA, and try to remember to dump your coffee or water bottle before you get into the security line. Probably the most aggravating part of the security process is everything you have to take off to get through to your gate. You’ll need to remove your shoes, your belt, most of your jewelry, your hat and any jacket or sweatshirt you might be wearing. Because of this hassle it pays to think ahead. Try to wear slip-on shoes to save yourself some time, and take the rest of the stuff off before you get in line. Ideally you’ll be able to slip them into your personal bag you’re taking on the plane. Then you won’t get frustrated if you’re running late for a flight. There are also strict rules about laptops. Although it may seem silly to you, the concern is that a piece of equipment that looks like a computer could in fact be an explosive device of some kind. Don’t get in an argument with the security guards about this line of thinking, as they are only doing their job. Instead, purchase a laptop case that is designed to pass through airport security. That way you won’t have to pull it out and risk dropping it in the midst of juggling all that stuff. Some computer bags actually fold open to reveal the laptop, so the security process should be super easy. Finally, try to remain patient and keep the process in perspective. The security line is there for your safety, and getting upset won’t move things along any quicker. Make sure you get your cup of coffee first, so you’re relaxed while in line. Just keep picturing the premier limousine you get to take at the end of the flight, or the fun you’re going to have with the friends you are traveling to visit. 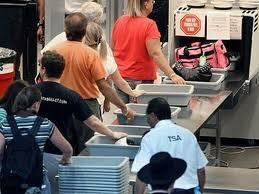 There’s no sense in making things worse, and a positive attitude will make the security line process seem to fly by.